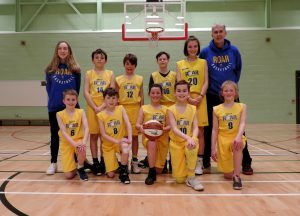 An exciting weekend for ROAR Basketball u12’s officially ending the season on Saturday 24th in Taunton. The final act being the playoff in the Southwest Regional u12 League with Taunton Tigers. In two previous meetings, ROAR have been well beaten by Taunton. The deficit has been reduced each time and the team put in additional prep including extra training sessions, film briefings and even entering the just for fun Glozball CVL purely to provide more player material to disect. The result of all the effort over the season and the focussed attention in the lead up to the game was by far the best performance from ROAR U12. In addition, every player on the roster had a best in season performance. The best player on the court for either team was clearly Seb. The way he took over when ROAR had a problem with early foul trouble showed why he is still in the “fabulous fifteen” regional selection. We wish Seb well with his ongoing progress with the regional squad. Seb was really well supported by every player around him. Players that threw themselves into defence and executed the offensive better than they have ever before. Right from the start ROAR set out our stall. High pressure full court defence coupled with pass and cut ball and player movement to shift the defence. Tigers by comparison recovered to sit back just out of zone and then punish mistakes on the break. Tigers took both the first two quarters by 23 – 21 and 21 – 17 to lead 44 – 38 at half time. 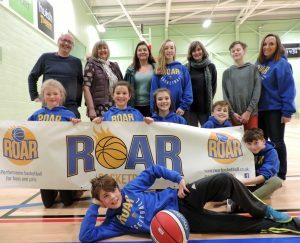 After the break, ROAR pressure started to break up the Tigers offence with ROAR taking the second half 19 – 16 and 18 – 17 so 37 – 33 overall. In the end it wasn’t enough as Tigers dribbled the ball out to take the win by 2 points 77 – 75. ROAR broke most of our own SW League records with this game. Our highest u12 score 75 (previous 26), highest score by a single player Seb with 42! , highest score from a support player Bodhi with 17, most individuals scoring – Seb, Bodhi, Cerys 6, Gabby 4, Alex 4, Evie 2. Terrific supporting roles with every player getting at least 1 assist and multiple rebounds from William ES, Will S and Alex GL. Missing on the day were James and Oskaras that have both made an impact for ROAR in the past. It was an amazing day for Herefordshire junior basketball that will live in the memories of players and parents that made the journey, not just to Taunton but all season long. Training notices out soon for summer training and preparation for 2018/19. If you or someone you know wants to join us on next years journey please get in touch today. Next:Girls u14 3×3 Basketball in Herefordshire!